by Ted ChapinIn doing some research recently into the original Broadway production of THE SOUND OF MUSIC, I came across an interview with Richard Rodgers where he was explaining that they were installing 18 reverberator speakers around the theater to give the audience a sense of being surrounded by the nuns' choral singing. It made me remember hearing of a conversation Joshua Logan had about SOUTH PACIFIC in 1949, when Rodgers and Hammerstein were experimenting with placing microphones across the footlights to enhance the sound coming from the stage. And that made me remember the wonderful photographs we have of Richard Rodgers conducting a special performance of OKLAHOMA! at the St. James Theater in 1947, where the front row patrons are practically in the orchestra. These thoughts, in conjunction with our recent introduction of computer orchestral enhancement programs InstrumentalEase and AccompanEase made me wonder about the whole question of theater acoustics and electronics, and how they have evolved together in recent times. The space where live theater happens has changed throughout time. Go to the ancient theater at Epidaurus in Greece, and while the acoustics are still amazing, imagine seeing a modern Broadway musical--with all its attendant spectacle and hoopla--performed there. Unlikely. When playhouses came indoors, along with challenges of lighting and new possibilities of stagecraft and scenery, the acoustics of the architecture remained influential. The stage was like the small end of a megaphone; the auditorium like the cone end, and the actors spoke or sung straight out front. That may have limited the ability for performers to interact with each other on stage, but at least the words could be heard by everyone in the auditorium. When the great Broadway showman George Abbott was asked to name the single biggest innovation of his nearly century-long career, he replied, ""Electricity."" It opened endless possibilities, starting, of course, with lighting and stagecraft, but also with sound. If you brought in microphones and speakers, you could both create effects previously impossible, and also free up actors to deliver lines without the rigidity of projecting out front. And then when body mics were developed--in the 1960's--a whole new world of amplification became possible. The music in theaters evolved as well. Whatever instruments were current were brought into the theater, and for theatrical presentations in which music played a major role, they were seated in front of the stage, on a lower level, sometimes on the same level as the audience. Placement of instruments was experimented with, since a trumpet is a lot louder than a violin. And of course, which instruments to use and how many became part of the equation with influence from both composer and producer. The orchestra pit evolved as well, and over time got lowered and moved under the stage. With each architectural move came a new set of acoustical problems. 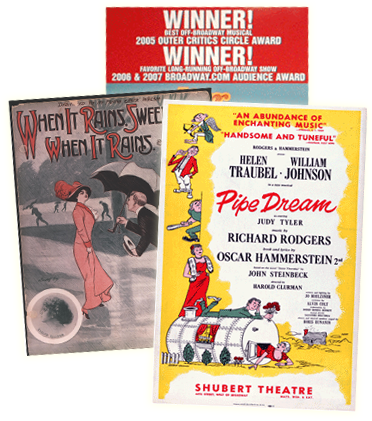 Robert Russell Bennett, the great Broadway orchestrator, said that he needed to take the architecture of the specific Broadway theatre a show was going to play into consideration when he created his orchestrations. Some playhouses favored low sounds; others were more hospitable to higher ones. That also effected how the pits were laid out--which instrumentalists would be seated dead center, and which would be seated at the far ends. And for many years, all the instruments used in the musical theater were acoustic, with sounds made by people plucking, bowing, blowing or manipulating things made of wood, metal, gut and the like. Then subtle amplification helped blend the acoustic sound into a whole. What about those instruments that use an electronic source for sound? The first experiments in electronic instruments were actually in Germany, in 1870. Inventors in the United States came up with the first electronic keyboard in 1915 and the Theremin, which made sounds using radio vacuum tubes, was introduced in 1917. That remained the basis of electronic instruments (which were mostly keyboards), through the 1960's when integrated circuitry took over. After 1980, the world of digital sound moved in and has become the foundation of today's sophisticated electronic keyboards, which can emulate sounds unimaginable years ago. And that brings us back to the original discussion--acoustics or electronics? Answer: both. The reality of today's theater is that we need to find the balance, and finding that balance is extraordinarily tricky. There are no easy answers. With the sophistication of the world of electronic instruments and amplification devices, along with today's economic realities, it is important for everyone to view each circumstance individually. But with electronics in the theater to stay, the cat is out of the bag."